HOUSTON (ICIS)--Initial settlements for US February propylene contract prices are at a 6 cent/lb ($132/tonne) decrease from the prior month, market source said on Friday, although the settlement is not yet marketwide. 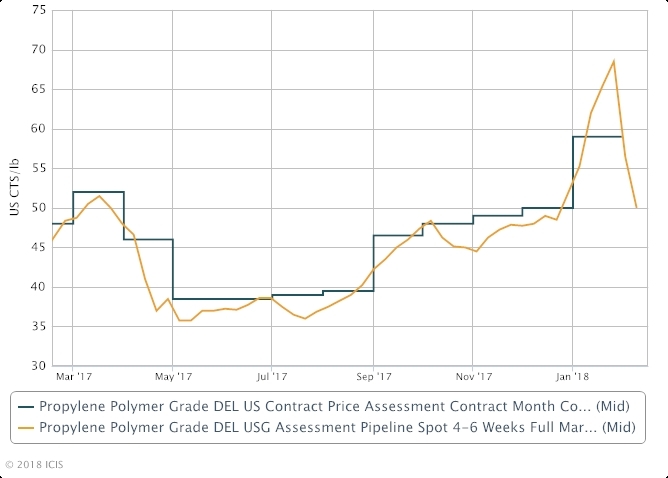 If fully accepted, the settlement would put the February contract prices for polymer-grade propylene (PGP) at 53.0 cents/lb, down from 59.0 cents/lb in January, and for chemical-grade propylene (CGP) at 51.5 cents/lb, down from 57.5 cents/lb in January. The decrease is in line with falling spot prices as lower demand has helped ease a recently tight market. A tight market following production issues with propane dehydrogenation (PDH) units in the US Gulf drove spot prices into the high 60s cents/lb in January and pressured January contract prices to a 9 cent/lb increase over December. The market has been waiting for the ramp-up of a new PDH unit at Enterprise's complex in Mont Belvieu, Texas, since it began start-up activities in November. The unit is currently expected to be fully operational at the end of February. An outage of a PDH unit at Dow Chemical's complex in Freeport, Texas, followed by an outage of the PDH unit at the Flint Hills Resources complex in Houston, Texas, further tightened the market in late December and January. The Flint Hills Resources PDH unit was restarted in January. The increase in both spot and contract propylene prices had pushed downstream prices higher, causing imported derivatives to be more competitive. For polypropylene (PP), which accounts for more than half of US propylene consumption, operating rates fell as downstream buyers increasingly turned to imports. Preliminary data from the American Chemistry Council (ACC) showed PP production in January was 15% lower than the prior month and 12% lower than the same month in the previous year. Amid the lower demand, PGP spot prices moved sharply downward in the last few weeks. Front-month PGP traded on Friday at 45.25 cents/lb. Meanwhile, propylene inventory levels have been building from low levels in late 2017. Stocks have built for the last five weeks to 3.203m bbl in the week ended 9 February, which is the highest level since 3.308m bbl in late September.